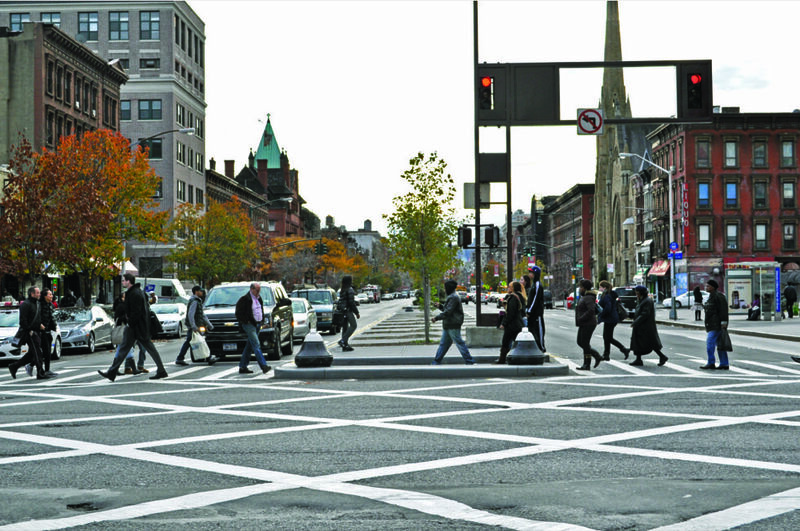 Major streets that connect neighborhood centers or run through the downtown can be daunting for pedestrians to cross, depressing property values and the quality of the public realm as a result. While many of these streets have significant traffic volumes at peak hours and bustle with activity throughout the day, there are opportunities to improve these corridors for everyone using them. 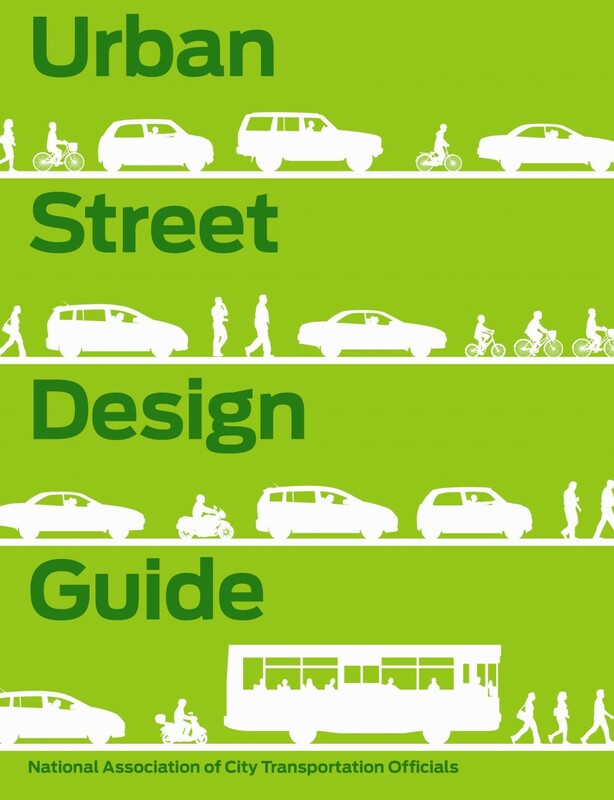 Add a central median and cycle tracks to enhance the experience of the street and to reduce its overall width. 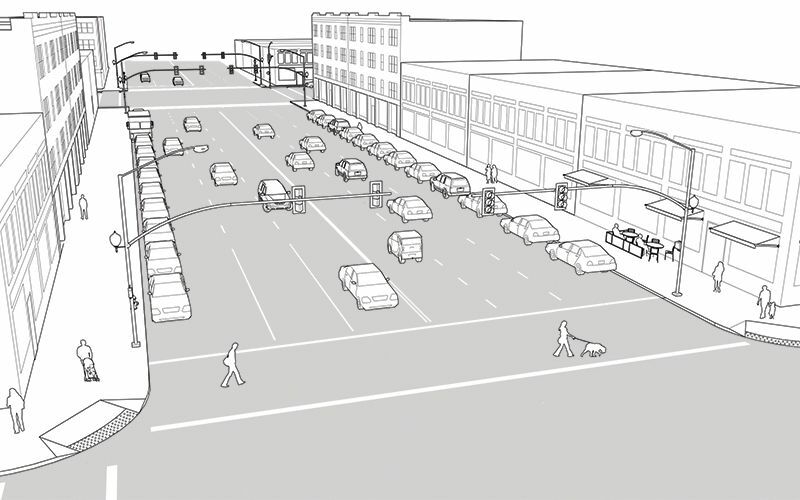 The street illustrated below depicts an 84-foot roadway within a 114-foot right-of-way. 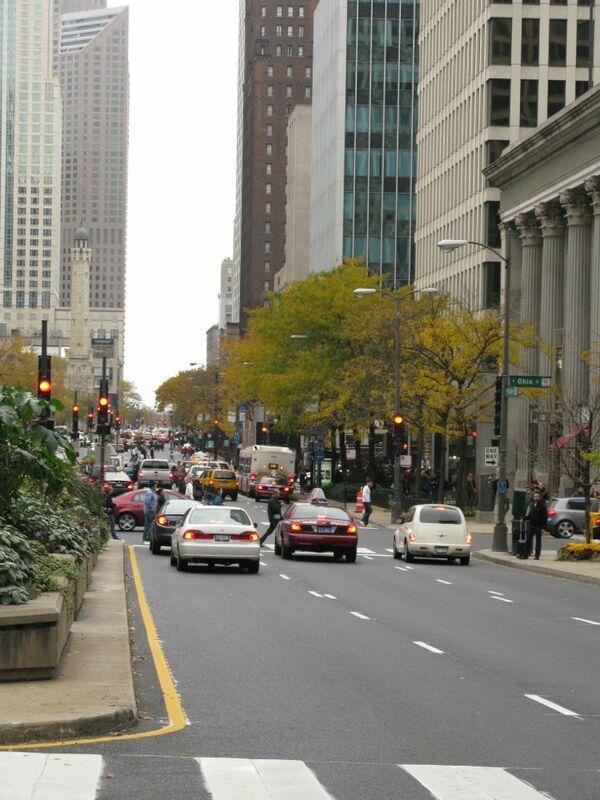 A parking-buffered 1-way cycle track, applied on each side of the street, offers a high-quality experience to bicyclists. 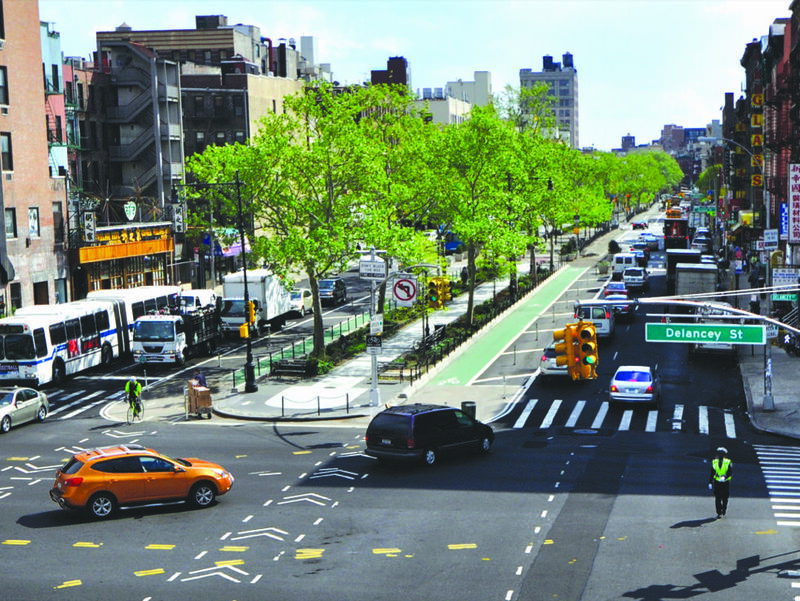 The illustration above depicts a major 2-way downtown arterial with 6–8 lanes of traffic. 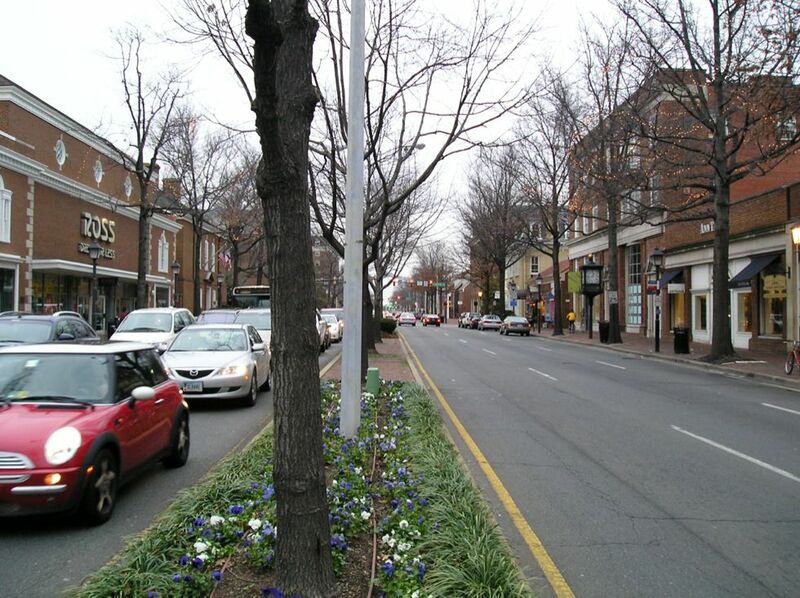 This street runs directly through the heart of the city and is a major connector to other neighborhoods. 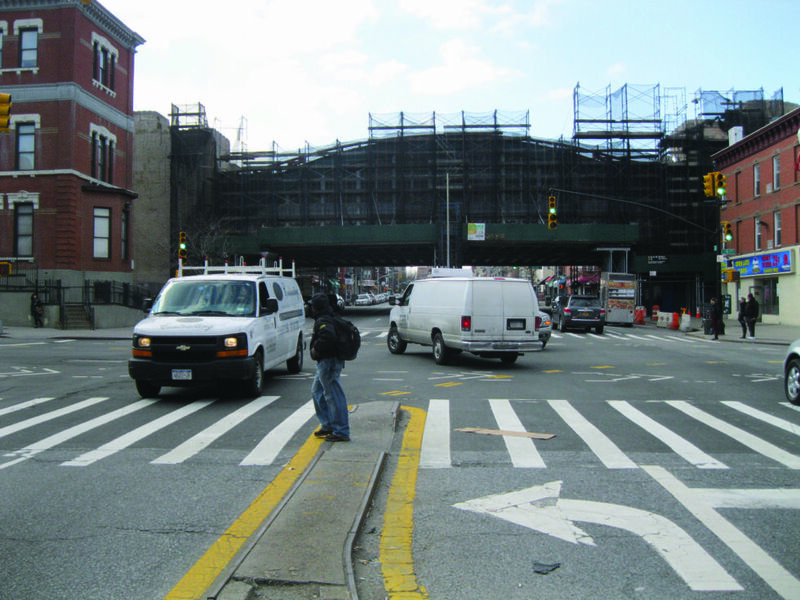 The street has heavy turn volumes and multiple signal phases, making it a barrier for people to cross. Left turns are a frequent source of conflict between motorists and pedestrians and a common cause of head-on collisions. Buses experience frequent delay due to the encroachment of parked cars, loading freight vehicles, and through traffic. Bicyclists lack any accommodation on the street whatsoever, forcing many to utilize the sidewalk as an alternative. 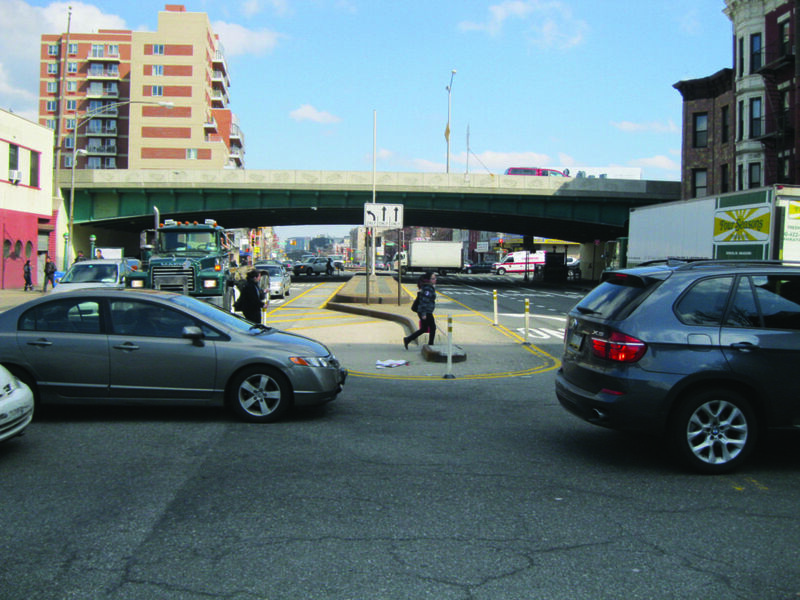 1 Assess left-turn volumes and evaluate the overall traffic network to determine whether or not left turns can be restricted or removed at a particular intersection. 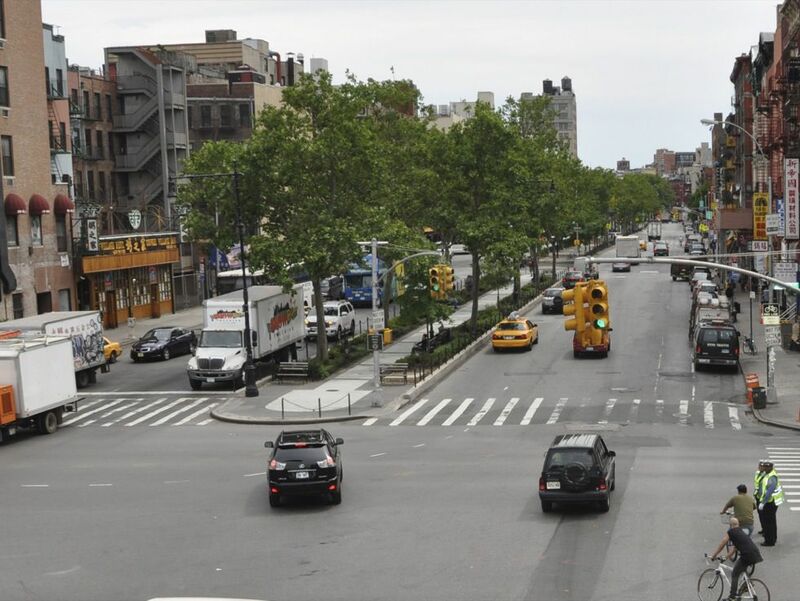 The interim reconfiguration of Brooklyn's 4th Avenue involved the closing of numerous left turn pockets that were either dangerous, underused, or unnecessary. 2 A parking-buffered 1-way cycle track, applied on each side of the street, offers a high-quality experience to bicyclists. 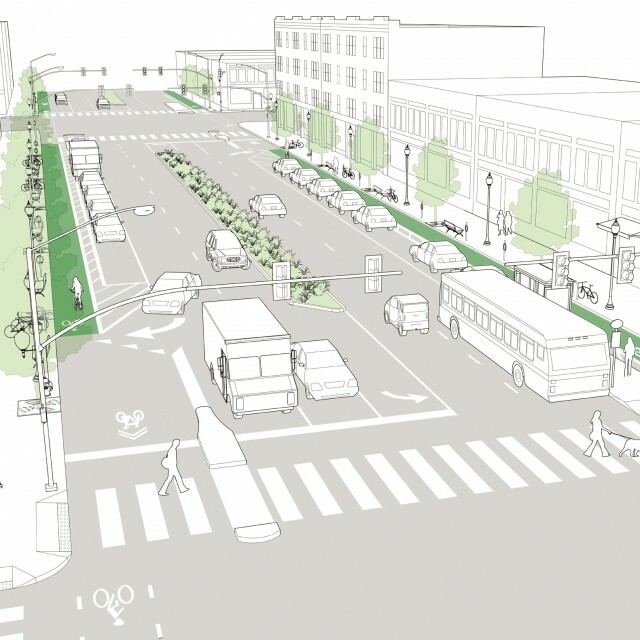 3 The cycle track may also be combined with an offset bus-boarding island and other amenities that improve operations for pedestrians and transit users. 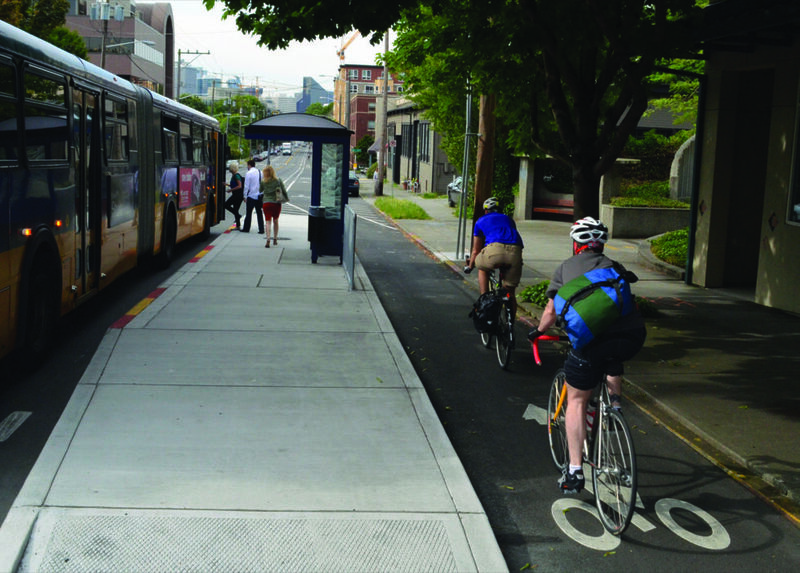 Offset bus boarding Islands help eliminate conflicts between bikes and buses, while improving bus operations and reliability. 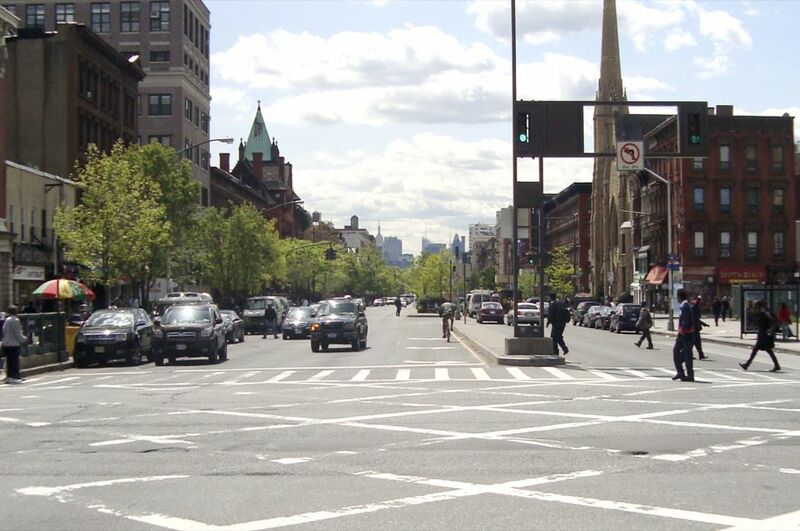 4 At intersections, 1-way cycle tracks may either mix with right-turning vehicles in a “mixing zone,” or, where turn volumes compromise bicyclist comfort and safety, be given a dedicated bicycle phase. 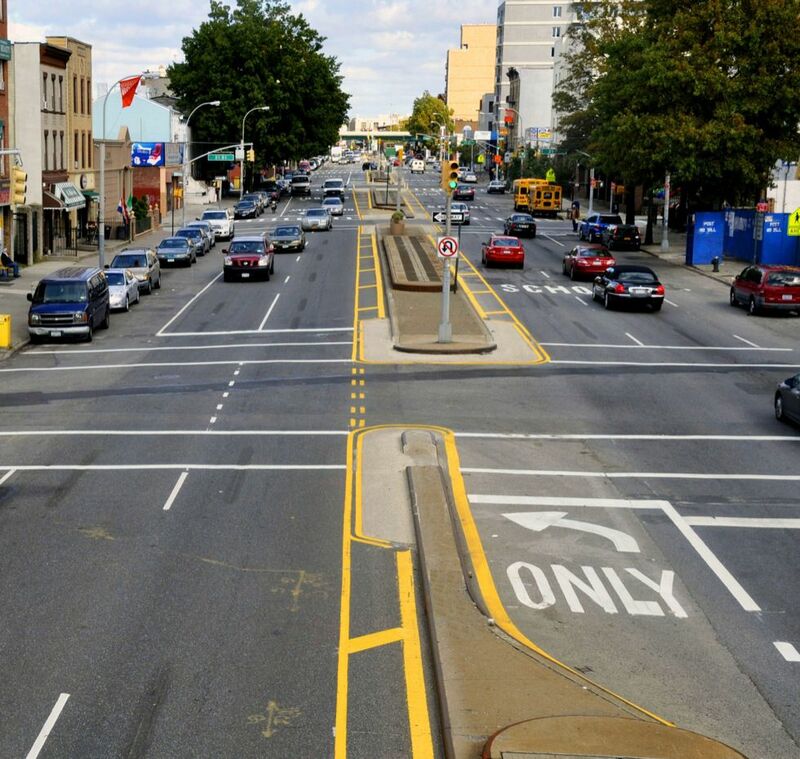 As an alternative to the treatment shown above, a 6-foot pedestrian safety island and dedicated left turn bay may be retained at the intersection by tapering the bike lane buffer and shifting the rightmost travel lane. Many major urban arterials with commercial strip development may be reconfigured using the same principles as described above. 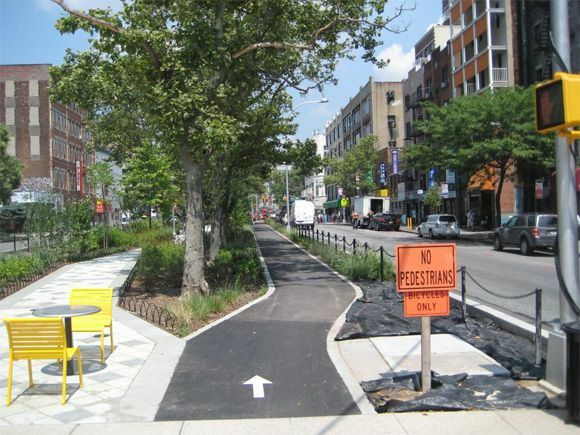 In such cases, land use changes and access management should be coordinated with the overall vision and redesign of the street. References for Downtown Thoroughfare: 1 found. ICF International, Freedman Tung, and Sasaki. 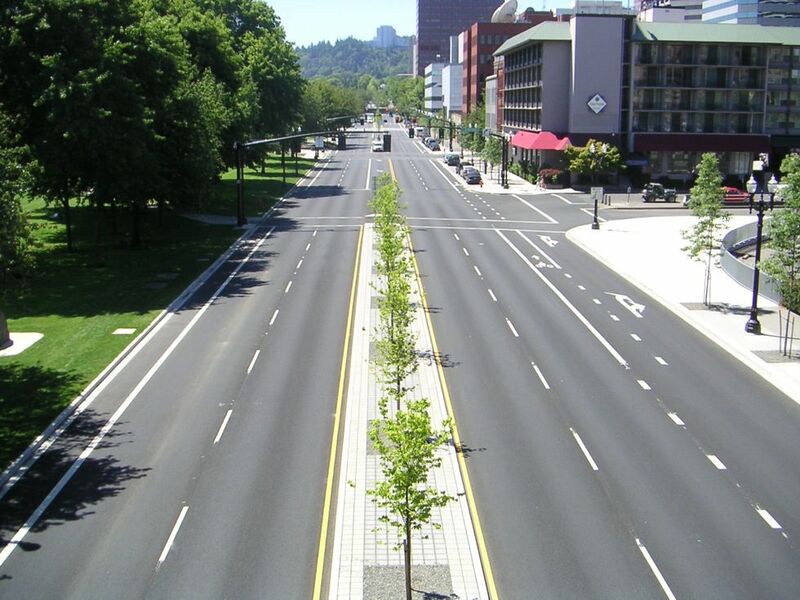 "Restructuring the Commercial Strip: A Practical Guide for Planning the Revitalization of Deteriorating Strip Corridors." 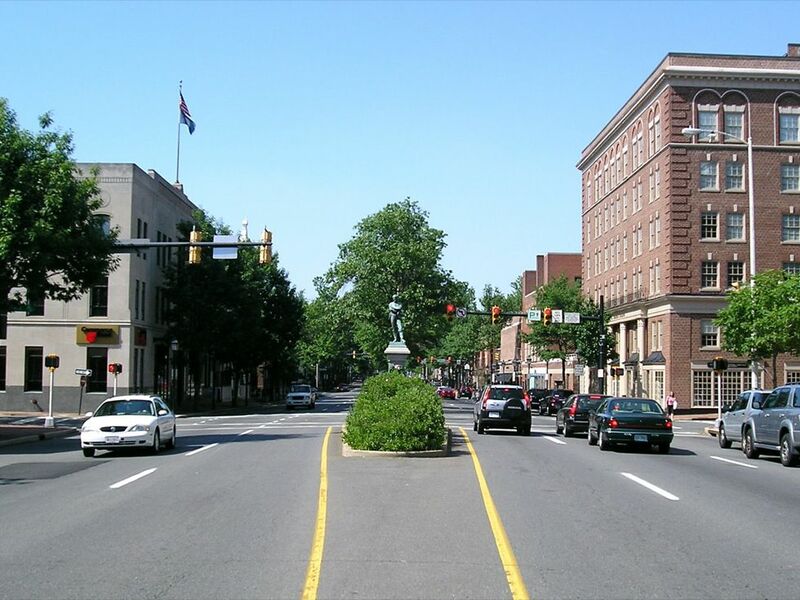 Development of a Nationally Replicable Approach to Smart Growth Corridor Redevelopment, United States Environmental Protection Agency, Washington, DC.